Well, technically I think it’s just over a month, but who’s quibbling! I’ve had a ball doing samples and making scarfs, trying different yarns and colours in plain weave. 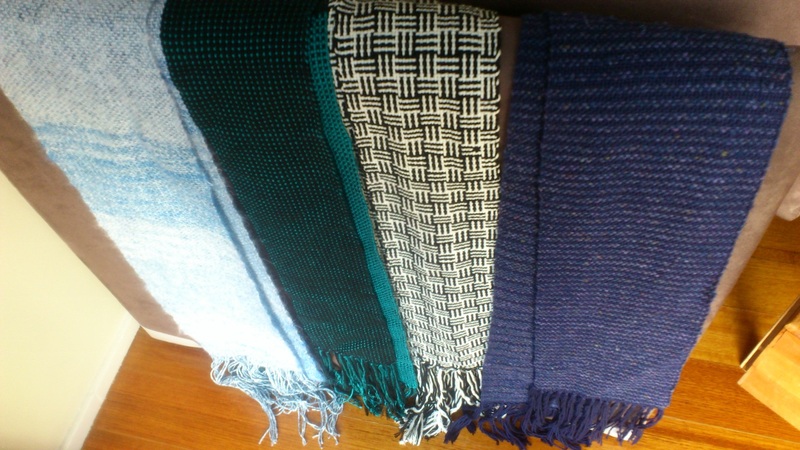 Here are the first 4 scarfs… The blue and white one came first (excuse the brightness of the mohair – there are more blue stripes in that bleached area). Woven with a white blue-flecked cotton warp and a variegated blue and white mohair. Then, of course, the log cabin scarf – woven in black and creamy white cotton. Here’s a detail shot of that green and black scarf. 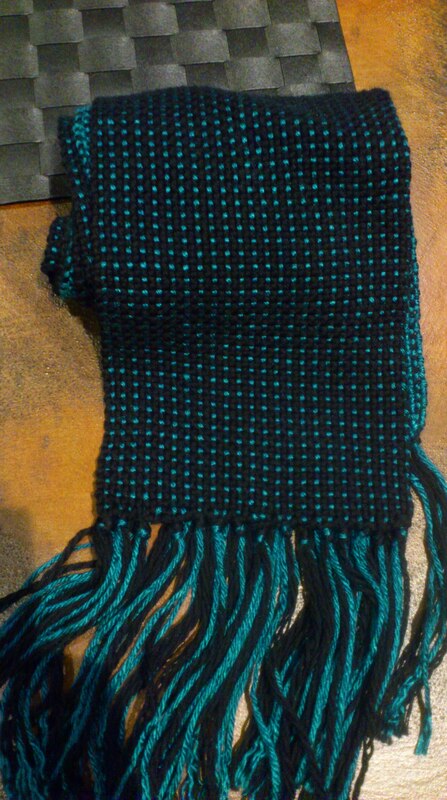 It was woven with black cotton and a teal silk. And finally, I wove the blue stripey one with a blue cotton warp and both the blue cotton again and a blue silk/cotton mix in the weft stripes. I had fun making the silk/cotton stripes wider as the scarf progressed while keeping the straight cotton the same. The other disaster involved black wool and a rather neat little sparkly poly. That was totally a lack of planning prior to my “dressing the loom”! Thankfully, both “crises” were instructional and the yarns will get put back on the loom at a later date. Loving words comes in handy when there is a bunch of new terms to learn. Weaving is a treasure trove! I particularly like “heddle” because it’s fun to say. (Also fun is “raddle”, which I’ll talk about another time.) But what is a heddle, and why is my loom a “rigid heddle” loom? The heddle is what keeps one warp thread separate from another and, ultimately, what lifts a set of warp threads up to allow you to weave. 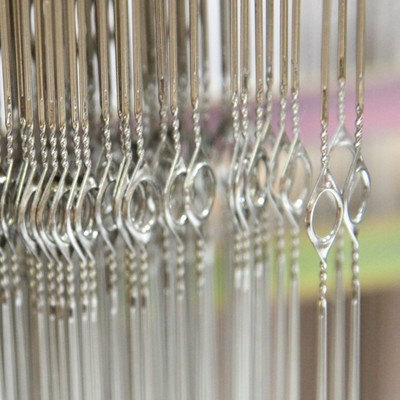 As well as passing through the heddle, each warp thread also passes through a comb like thing called a reed. This helps to keep your weaving tidy and – to some extent – control the density of the cloth. 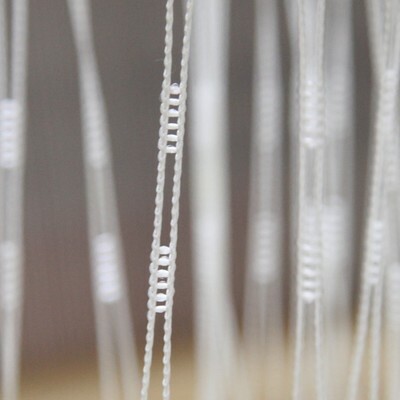 It does this by setting the spacing of the warp threads. The reed, while a thing in itself, is also a part of the beater that you use to “beat” the weft threads into place. Usually the reed sits inside a frame of sorts so that you can easily pull the reed forward to beat the weft when you need to. 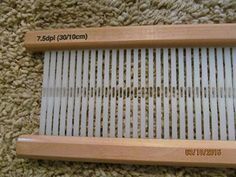 You can see the long “slots” are just like in a reed for other looms, but the solid area between each slot is a heddle (“hole”) and it’s altogether used as the beater. Very clever way to combine 3 things into one! I’ll talk more about this type of reed when I get into the specifics of rigid heddle looms, but it has both benefits and limitations. So far, I’m just loving the benefits.